Steps to get Visa Vietnam online | How to apply for a visa on arrival? Type of visa (single – exit and enter one time) or (multiple – exit and enter Vietnam more than one time) (during your chosen time). After you send us your completed application form and pay us the service fee, we will send an email to you confirming that we have received your request. You then please check your information (in attached file) correctly before we send it to Vietnam Immigration Department to process your visa promptly. For visa on arrival (pick up visa at arrival airport / for traveling by air ONLY), you will receive a Vietnam Visa Approval Letter(Jpg) via your email. The necessary processing time is 2-3 days in normal case and only 4 working hours in urgent case. 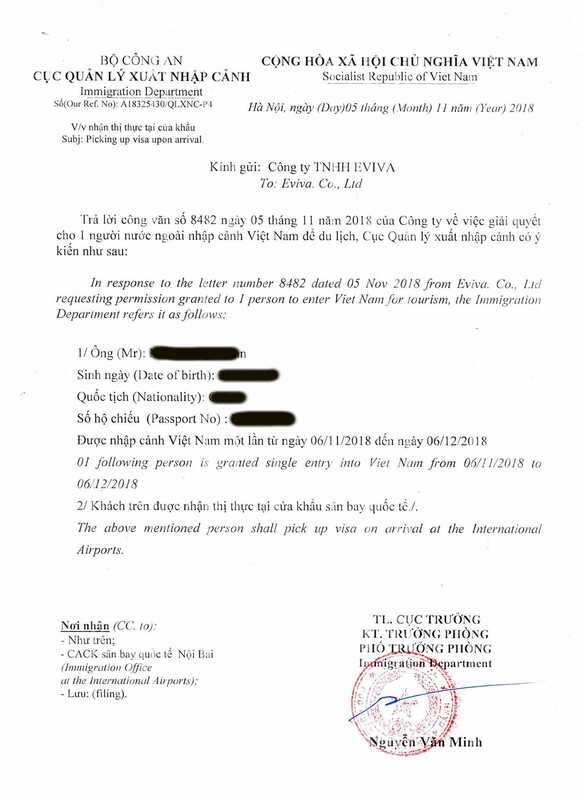 Right after receiving your original Approval Letter from Vietnam Immigration Department, we will send a copy to you via email. This Approval Letter is an evidence to get your official visa at Vietnam Airport. You are required to show passport and visa approval letter when checking in for a flight to Vietnam. Note: Please check your mailbox also including spambox then make sure your information is correct, print this Visa approval letter + Entry and exit form and bring them with you to Airport. At the Visa On Arrival Counter: Upon arrival at Vietnam international airport, kindly follow a sign board to the visa on arrival counter. Please hand in all of the above listed in STEP 2 and wait here to pick up your visa and passport. At the Immigration Counter: After getting the visa stamp, please queue up in front of the Immigration Counter to get an entry stamp in your passport. Note: Stamp fee is paid directly at airport but not our service fee.